Darksiders 3's release date was officially announced today (November 27th). After the fall of THQ, fans of the series were concerned that the second installment may have been the last. But THQ Nordic, the company formerly known as “Nordic games”, acquired the franchise. 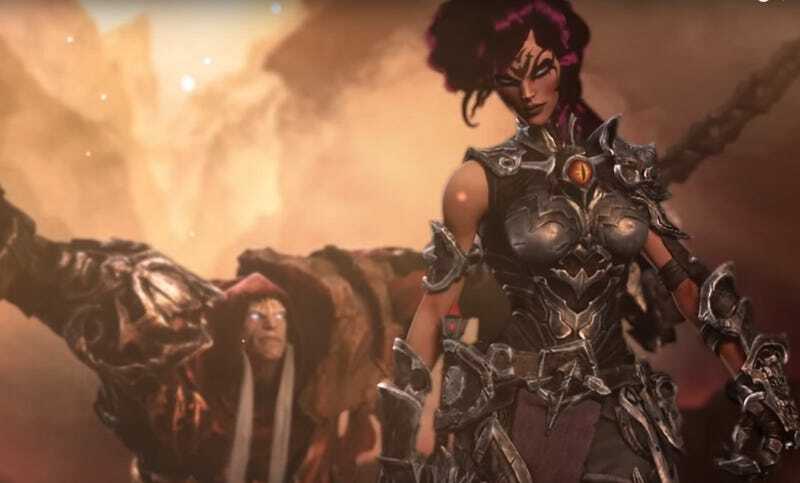 Since Vigil games is no more, Darksiders 3 will be developed by a new studio, Gunfire Games. I didn’t know until today that they decided to move away from the traditional four horsemen of the apocalypse. They are widely accepted to be: War, Death, Pestilence, and Famine. But the new main character is “Fury”. Why would they do this? Well, I think it might be the right thing to do. It could be that the developers racked their brains, trying to think of ways of how a horsemen of disease and lack of food could make a good hack and slash character. I could think of a few ways for pestilence, but famine? What’s he gonna do, starve his enemies to death? That’ll take days. The enemies could just be people delivering bread, and you run up and steal it. But that doesn’t sound very exciting. It could also be that, if the original intention was to have the character be a different horsemen of the apocalypse for each new entry in the series, then you can only have 4 games in the series. But with the introduction of this character, the series can continue in perpetuity if THQ Nordic wishes. Let’s see if the game is successful enough to warrant such a thing.